Located 18 miles west of Fort Walton, sits a coastal secret that has been discovered by some loyal tourists. That area is Navarre Beach! Navarre Beach is home to an incredible beachfront complex, Navarre Towers. Navarre Towers offers 2 and 3 bedroom condo rentals with fully equipped kitchens, a community pool, private balconies and much more. The beach access is extremely convenient as the complex sits Gulf front. These condos provide incredible views for your next vacation and with many units, it's a great place for the whole family to stay. The Gulf side pool is heated seasonally, making sure that it is warm enough to swim in at all times of the year! 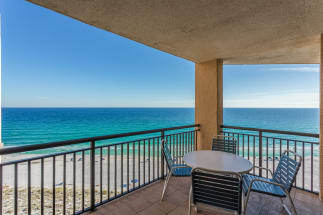 Navarre Towers sits in an ideal location in Navarre Beach. The condo complex provides easy access to many things to do in Navarre. Enjoy a day out on the water with one of the many local fishing charters, take the kids to the Sea Turtle Convention Center or rent paddle boards and kayaks and explore the emerald green waters on your own. There is fun for the whole family when staying in Navarre! Book your next Navarre Towers condo rental on Emerald Coast By Owner. ECBYO provides you a variety of Navarre Towers rentals and each listing is equipped with the owners or managers contact information. Feel free to contact them directly today to book your next Navarre vacation!